# SAN40MPF-XW600 - Silicone Flanged Clamp Gasket - White - 6 in. Gasket material approved by (3A), USDA and complies with FDA's Code of Federal Register (CFR) title 21, Part 177 and meets 21CFR177.2600 and 1550. PSI Service Ratings for the sanitary clamps DO NOT APPLY to connections (1" and above) using any PTFE gaskets, due to the potential for cold flow under normal operating conditions. 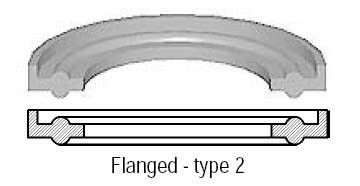 PTFE gaskets, when used with any clamp, are likely to leak at pressures far below the published service ratings. This restriction does not apply to the fractionally sized ½" and ¾" connections, due to their recessed, fully contained design.